In the opening moments of The Hand That Feeds, a man flips through a wad of bills, tallying up the money he’s earned for his labor. The grand sum turns out to be $290—not staggering, but not bad for a day’s work. Unfortunately, that cash doesn’t represent his compensation for eight or nine hours on the job; it’s what he gets at the end of a 60-hour week. “Is that minimum wage?” asks a voice off-camera, in subtitled Spanish. The man, whom the film later identifies as a dishwasher named Margarito López, confirms it isn’t; it’s actually much less. In The Hand That Feeds, co-directors Rachel Lears and Robin Blotnick clearly convey that Lopez and his fellow employees at Hot & Crusty, a grab-and-go-style deli on Manhattan’s Upper East Side, aren’t getting what they deserve, including appropriate salaries, paid overtime, vacation, sick days, or respect from their manager. But the filmmakers don’t dwell too much on the nitty-gritty of those details. 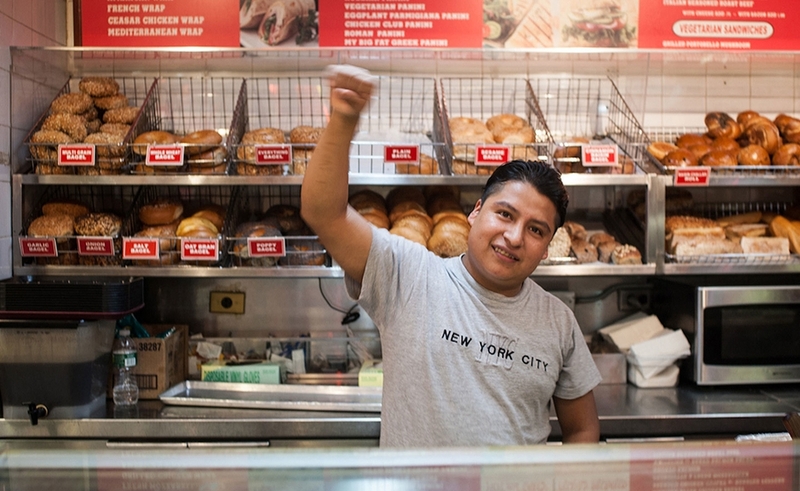 While their documentary acknowledges subpar working-class conditions, Lears and Blotnick instead focus on the struggles that arise when a group of immigrant workers at one of New York’s countless bagel-sandwich shops attempt to reclaim some of their rights. The result is both a cautionary tale about the false hope perpetuated by the American dream, and an uplifting film that suggests some version of that dream, even in a U.S. with an eroding middle class, can still be achieved. If The Hand That Feeds has a Norma Rae, it’s Mahoma López, a soft-spoken husband and father who works behind the sandwich counter. With the support of a grassroots social and economic justice organization called the Laundry Workers Center, López becomes the increasingly confident and diplomatic leader of an effort in 2011 and 2012 to unionize at Hot & Crusty and negotiate a more favorable contract with management. When the Mexico City native is initially introduced as one of the doc’s key characters, the film effectively casts images of him on a playground with his two sons against a voiceover in which he describes his initial excitement about settling in America. “You have that adrenaline pushing you to come here,” he says, while one of his boys happily dangles upside down from a jungle gym. “Whatever the reason, there’s a feeling of adventure.” It’s a sharply edited sequence that, in just a few seconds, captures the promise of youth and how that eventually evolves into a sense of personal and familial responsibility. The Hand That Feeds could have been told entirely through his lens, but the filmmakers cast their net wider, and as the movie progresses, it becomes clear why. The victories in the effort to establish the Hot & Crusty Workers’ Association speak to what happens when multiple individuals channel their efforts toward a worthwhile cause. The employees at Hot & Crusty stage protests, organize picket lines, and circulate flyers, but their actions have the most impact when they are joined by people in the community, fired-up change agents from the then-burgeoning Occupy Wall Street movement, and members of other unions who rally behind their cause. By building the documentary around an ensemble cast, Lears and Blotnick demonstrate, in terms of content as well as filmmaking, that the voices of a few can galvanize the voices of many. The bosses’ voices aren’t heard in The Hand That Feeds. None of the original owners or investors in the 63rd Street Hot & Crusty (now under new management) or its sister restaurants agree to speak on-camera in the film. And while clips from newscasts and coverage of Occupy Wall Street suggest that the Hot & Crusty story speaks to larger, national issues, the filmmakers could have benefitted from delving more deeply into those connections. If they had, this movie could have been a more central talking point in conversations about the state of the U.S. economy and immigration reform. As it stands, The Hand That Feeds is an illuminating sidebar to that conversation. It’s also a reminder that, as López notes, it’s the hard-working, determined immigrants who keep New York and many other cities running every single day.